The 2018 Super Bowl has turned out to be quite different from Super Bowl’s in the past in terms of both audience and advertising. We could call this a good-news and bad news year. The good news is that average ad effectiveness for the Super Bowl was the highest in the past 6 years. But the not-so-good-news is that the audience and ratings were the weakest in nine years. This might be due to the regional concentration of the two eastern teams or also the political fall-out that the NFL has suffered during this season due to the National Anthem controversy. Nevertheless, the audience numbers are down, which are a continuation of the declining TV ratings for NFL Football for the past season. And, according to Kantar Media, Super Bowl ad spending at $414 million was up over 6 percent from Super Bowl 2017. The big question, therefore, is whether advertisers are willing to continue to spend more for smaller audiences? Is the value equation getting weaker? Is there even a value in the equation at all? Ad engagement. As a result of seeing the ad, did the viewer do something positive towards the brand such as visit the website, store, engage in WOM, contact the company, recommend the brand or were they motivated to buy? 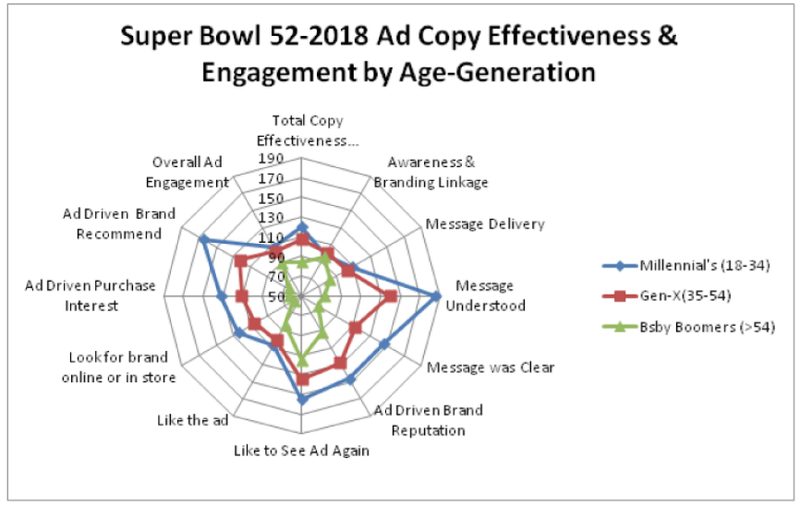 The chart below shows trends in overall Super Bowl ad copy effectiveness over the last six years. The average 104 score in 2018 was the highest over this time. By contrast, after Nielsen audience numbers ranged in the 110 – 114 million ranges from 2013-2017, this year’s ratings dropped to a low of 103 million. 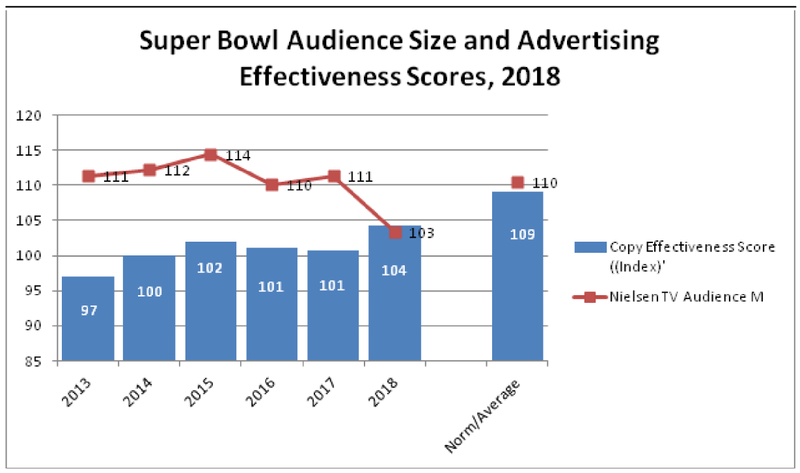 Similar to our findings last year, and despite the improvement in copy scores, Super Bowl ads remain significantly below the ABX average TV copy score of 109 during other parts of the year. So while the ads garner a premium price, the evidence shows they do not produce the results of advertising during other times of the year. When we look at all 60 Super Bowl ad copy scores, as shown below, we see a very wide range of effectiveness scores. It is interesting to note that the NFL ran ads during the Super Bowl, promoting their own league and game. These ads had a high level or expressed “dislike” and were among the poorest performing ads in the group. There is no secret that the NFL’s TV ratings and attendance has been off this year and that the Star Spangled Banner issue has turned off a number of fans. All of this could be a reflection of a reputation and branding problem by the NFL that could carry forward into next season. 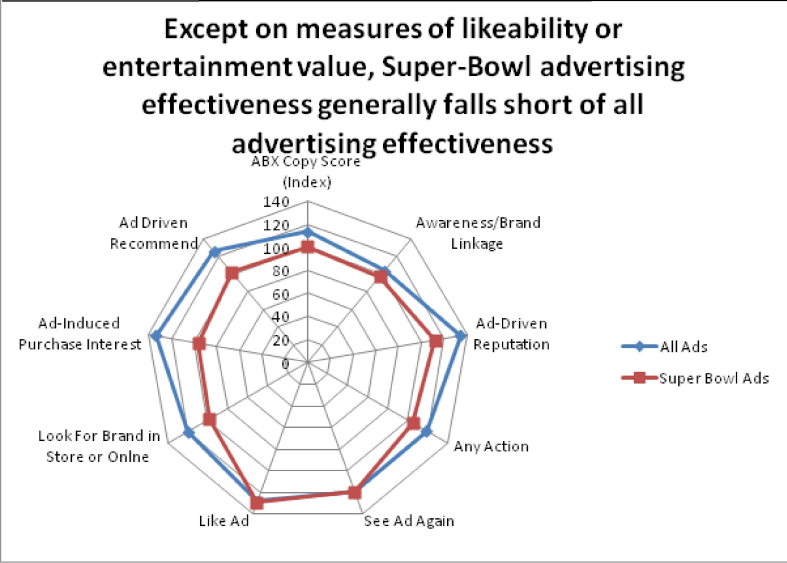 As shown on the chart below, Super Bowl ads fall short on most key adverting performance metrics when compared to all other advertising. The gap, however, is greatest on motivating action and ad engagement. Who are most responsive to Super Bowl ads? When we look at copy score ratings across the age-generations, we see a somewhat surprising result. That is because conventional wisdom believes that Millennials are the least responsive to advertising. For Super Bowl advertising, however, the exact opposite is true. By contrast, the die-hard and older (Baby Boomer) football fanatic is not so much. In the case of the Baby Boomer group, this also was the group that showed year-over year declines in copy effectiveness; so the advertising interest is moving younger. For advertisers who really want to advertise to the Millennial group, Super-Bowl advertising is one place to go. While Super Bowl advertising remains a singular event which draws among the largest television audiences of any event, it could very well be losing its luster. It’s audience is declining. The TV ratings of the NFL are down and we might be in store for continued shrinking audiences in the years ahead. It needs to break the cycle of "spending more for less." If real ROI is the objective, it might not be the correct investment. The NFL appears to have a branding and reputation problem and has become a political lightning rod. Ads with a strong social message did very well. This is a great forum for companies to show their humanity and social conscience. Doing so does great things for brand reputations. The Super-Bowl could be morphing into a big public relations platform. Surprisingly, Super Bowl ads play very well with Millennial audiences; and this is a powerful forum for advertisers who want to reach that demographic in a big way. Are you satisfied with how you are measuring advertising effectiveness? Is it resonating through Awareness and Message, and having an impact on Reputation and Action? ABX provides the largest normative database in the industry across all media types. On average you can improve your creative effectiveness by almost 20%. If you have questions, or would like a quick, informal chat, please click here.